Fan of the movie "Caddyshack"? This looks just like Rodney Dangerfield's (Al Czervik) boat in the movie! Have you ever dreamed of owning a yacht of your very own? Or maybe you are looking for something fun to do while you drive yours around the world. 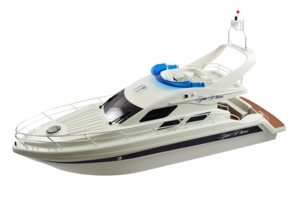 Either way the remote control yacht Saint Princess is a fabulous radio control boat that will truly enhance any outing on the water. Drive forward, backward, left, right, and straight. Whether you are cruising around the lake, the bay, or the open sea you'll be proud to own the RC Saint Princess. Reach speeds of about 15-20 mph. The gorgeous and detailed design of this 26" yacht will leave you in awe as you watch it cruise around the water. Still want more? Order today and we will include a rechargeable battery pack and wall charger. Order up to 6 of these boats and we will include free frequency crystals so you can drive around with your friends. "Hey, that's not a boat, that's a yacht!" This was a gift to a 9 year old who loves boats. He is overthemoon with the unexpected detail that he sees in his new yacht and cannot wait to get it on the water.